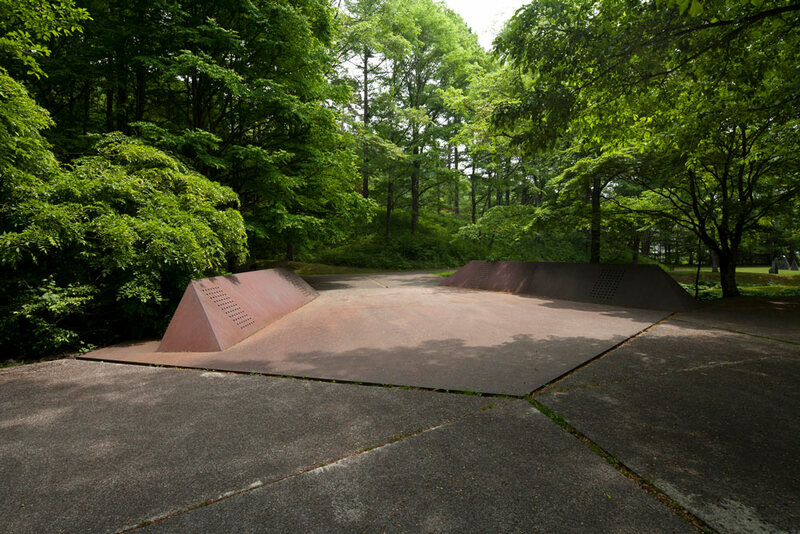 Sezon Museum of Modern Art, through the concept of being the museum inside nature, is made to blend in the nature of Karuizawa resembling a low-rise tea-ceremony arbor. The layout of the museum was done by Kiyonori Kikutake, who is one of the leading architects of Japan. 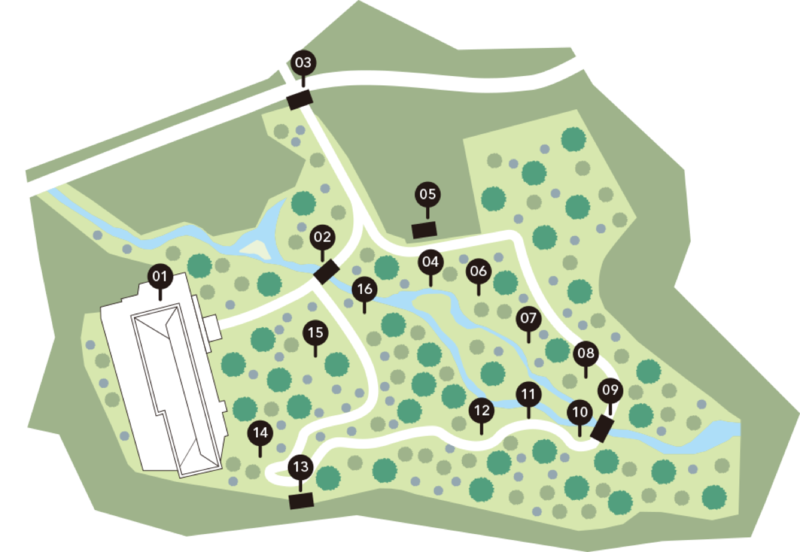 The garden is a circuit style garden with the idea by Isamu Wakabayashi, made possible to walk around listening to the murmur of the river inside the forest. Walking through the straight road from the open steel gate, the museum starts making its appearance from the gap between the leaves. Passing the creek being called by Isamu Wakabayashi ＜The pentagonal iron bridge”＞, a bridge like a plaza split in two, ＜Rain Mountain＞ by Isamu Noguchi, Kan Yasuda＜Tenmoku-Tensei＞, and to the beyond rises Mt. Asama. A garden by sculptor Isamu Wakabayashi was made in 1985 as a plan to extend the skirts of Mount Asama. Intruded by the colors of nature such as the sunlight of Karuizawa, rain, fog, and the greens and autumnal tints, this space as a garden comes into life. Walking down the narrow road next to the side of the slope, the universe of Bukichi Inoue ＜my sky hole 94-5 labyrinth of stone＞ expanses, and by the cape of the stream visible from the the another iron bridge by Wakabayashi, wasabi was said to be picked in the past. 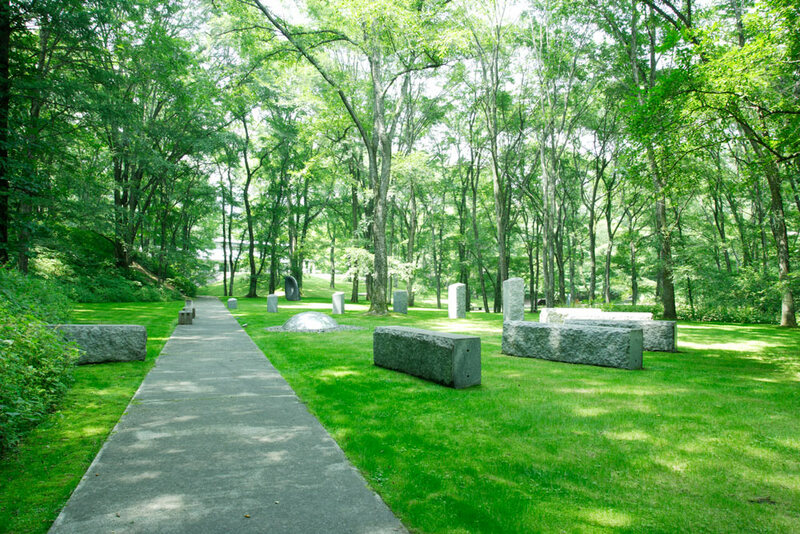 In the grass where the field of view is open, ＜Sound of Wind＞ by Masamichi Yamamoto, ＜YU-6＞ by Kenjiro Azuma, and after passing those two comes Isamu Noguchi’s ＜Cloud Moundtain＞ on the left side, Mount Asama on the right side comes into view. Viola grypoceras in the season of fresh verdure, tiger lily and an nearly golden ligularia fischeri blooms, leading its path to the museum with other numerous sculptures filled with small discoveries.